Cast aluminum is an easy repair with Super Alloy 5 and an oxyacetylene torch. Mike brazed this cast aluminum intake manifold from a Toyota Land Cruiser–it had a 3 inch cut through the cast aluminum. 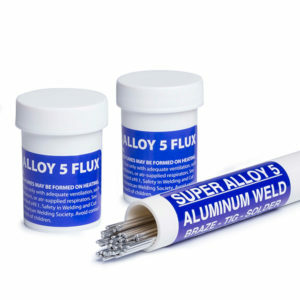 Thick aluminum dissipates heat quickly, so oxyacetylene was the preferred choice to ensure the base metal remained hot enough to flow the Super Alloy 5 aluminum welding rod.